Java's Bachelor Pad: I wish I could say you're the first mermaid we've featured here, but that honor goes to Diane Webber who played the Queen of the Mermaids in the film, "Mermaids of Tiburon." That being said, mermaids are a rare catch indeed. (Sorry about the pun...I have a feeling that's going to happen a lot here.) 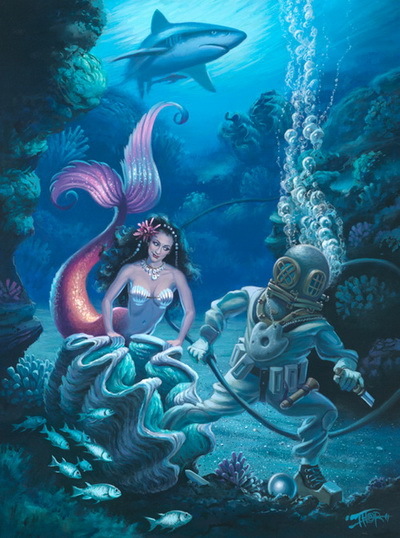 How did you get started as a mermaid? Marina the Fire Eating Mermaid: Woah~ to be even in the same sentence as Diane Webber is fine by me! (Of course I have a copy of the film 'Mermaids of Tiburon'!) I have been free diving since the age of three, when my Dad & older brother would often take me on their underwater excursions in the Caribbean. That combined with my Polynesian and Belly Dance background, add a generous dash of retro-entertainment and pop culture (both HUGE interests of mine) and well it was an inevitable result. JBP: Talk about your mermaid outfit. What the tail like? And those shell bras. How does one go about shopping for shell bras? JBP: Why a mermaid? Did you just wake up one day and decide that's what you wanted to do? MtFEM: Why a mermaid? Well, it is indeed an identifiable figure. The image of a mermaid has made itself quite a little niche in mid-century culture and continues to endure so it seems. I do also perform underwater pearl dives, dances and acrobatics without a fishtail, but I seem to get a lot of interesting attention when the fin is on. MtFEM: I'm inspired by anyone who takes the road less traveled. Pioneers who are tagged "odd" or "unusual", but still persist in following their artistic visions. Names? Eartha Kitt, Bruce Lee, Freddy Mercury, Gene Kelly, Esther Williams...to name a few. JBP: You also eat fire, walk on a ladder of swords, lay on a bed of nails...wow...I'm getting tired just listing that all. Is there anything you don't do? JBP: Now, you appeared in Bachelor Pad Magazine issue 5 and people got to see you in your human form. And I have to say, it's a real shame you hide those legs in a mermaid fin. How did you get interested in pin-ups? MtFEM: Ah--I perform just about as often with the fin as without it, so most folks have gotten a peek at the gams. My interest in pin-ups stems from a desire to better connect with the audience or with the fans. It allows the viewer an opportunity to feel like they can more closely relate to the image. I find the idea that no two people thinking alike when gazing at the image intriguing. MtFEM: To have my likeness appear on as revered a canvas as THOR's for 'Perils & Pearls' is a thrill beyond words. He is such an amazing visionary in his work--really captured the essence of undersea adventure in that piece. I particularly enjoy how it resembles an illustration from an old diving book or adventure novel. JBP: What's the worst mermaid-based pick-up line you've heard? I've bet you've heard "Nice tail" more times than you can count. MtFEM: Worse pick up line: "You've got some nice shells." (That's so cliché- Auwe!) And yes, there have been MANY others. JBP: What's next for you? MtFEM: I have a variety of projects in the works, from more frequent appearances at different tanks and pools throughout the U.S. & abroad, to DVD video projects & quite possibly a podcast. You will have to check in on me often to find out!